For me, the Red Raven Movie Records are one of those fond memories from childhood. These records, with their little mirror device that you place on top of the record as it spins imparts motion in the form of little 16-frame animation cycles. Based on the "Zoetrope" effect in which a series of pictures when spun create the illusion of motion by way of a special device. 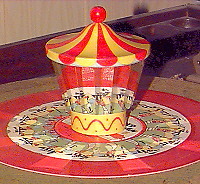 The original Zoetropes were rotating hollow cylinders with a series of evenly space slits in the sides. A strip containing the image series, (total number same as the slits), when placed inside the cylinder provide a simple animated "movie" as the viewer peers through the rapidly moving slits, which works the same manner as the shutter on a movie projector. On the Red Raven Movie Records, the 16 image cycle, (in that image one begins where image 16 left off) is printed on the outer two inches of the larger-than-normal label. When the Red Raven mirror device, (left) is placed on the turn table atop one of these "Movie Records" the images appear to move. Of course there are 16 mirrors aligned at an angle to the surface of the record, which does the same job that the slits in the cylinder did. I remember watching in awe as a young contemporary of mine proudly played these records. Needless to say, I remember the little movies more than the tunes! The ones I have are dated at 1956. They were produced by Morgan Development Laboratories, Inc. from Westport, Connecticut. The "band" is listed as "Red Raven Orchestra" Directed by George S. Chase. Talk about "primal multimedia!" Anyway, I happened to find a half dozen of these guys in a local antique store. If anyone has any information about the outfit that produced these records, please let me know! I received an email from fellow 78-L member Mr. Görgen Antonsson in Sweden, who informed me that the Ravens were sold in Sweden as well. The labels said "Film-Karusell" with "Made in Sweden" at the bottom. No mention of Red Raven, even though he was prominently displayed on the label, and the sequences were identical to their U.S. counter parts. I initially converted some of these little "movies" into animated .GIF files for display here at The WAMS Web accompanied by their respective RealAudio, (remember them?) streaming audio files. Now, in the technically advanced 21st Century, I plan to revisit these clips, and to post them as streaming video files, with their accompanied audio. Stay tuned! Here This is indeed true 78rpm multi-media technology.